My design, the eXtreme Kaos is coming along well. I finished painting it yesterday. I have added decals and will explain how I did that later. 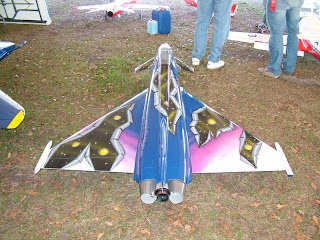 The white paint is Coverite's Century 21 and the Insignia Blue is Lusterkote by Top Flite. Both paints are excellent! They dry to the touch in about ten minutes and are supposed to be fuelproof, up to 15% nitro, after 24 hours. Both paints are easily sandable. 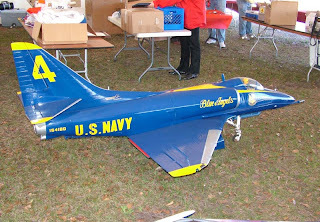 I used Pactra pin striping and put a very thin gold stripe to separate the blue from the white on the fuselage. 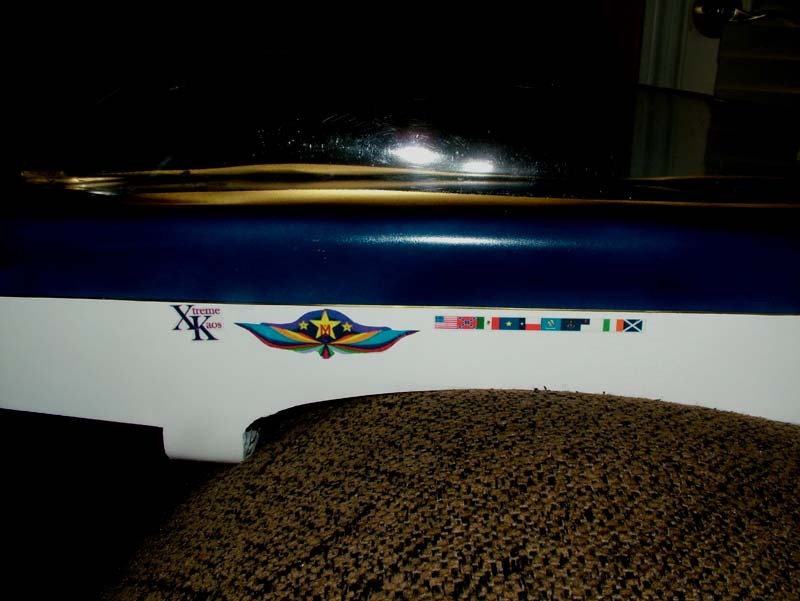 I put four stripes on the right side of the horizontal stabilizer. 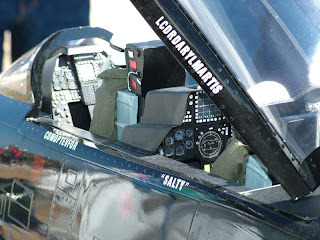 Testors makes decal material. I have found it at hobby shops. 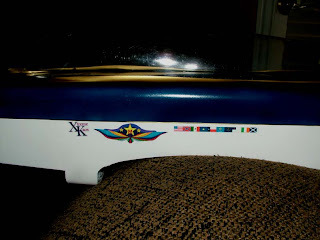 After creating the decal design on your computer, simply print the design onto the decal material. 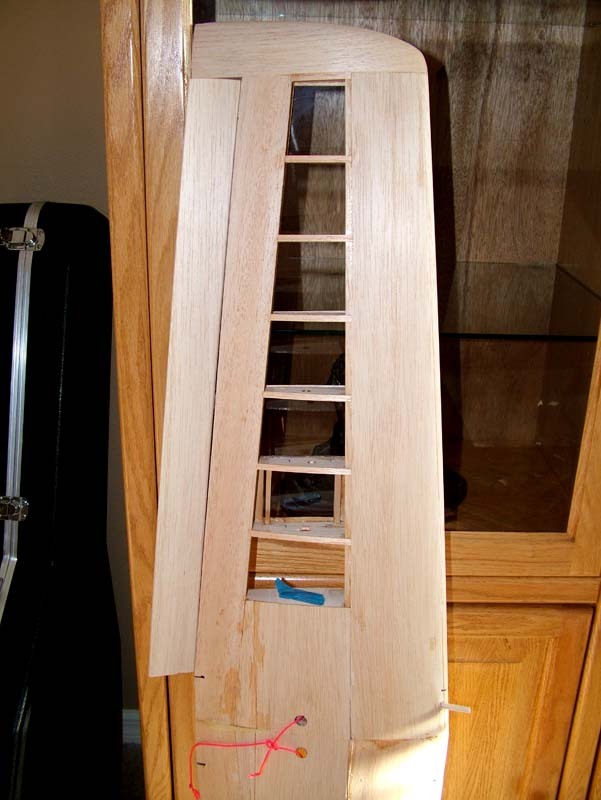 Then cut the shape out, spray with a clear coat. After it is dry, soak the decal for a minute or so, then slide the decal in place. I have had pretty good luck with these decals but the sheets of material are small. 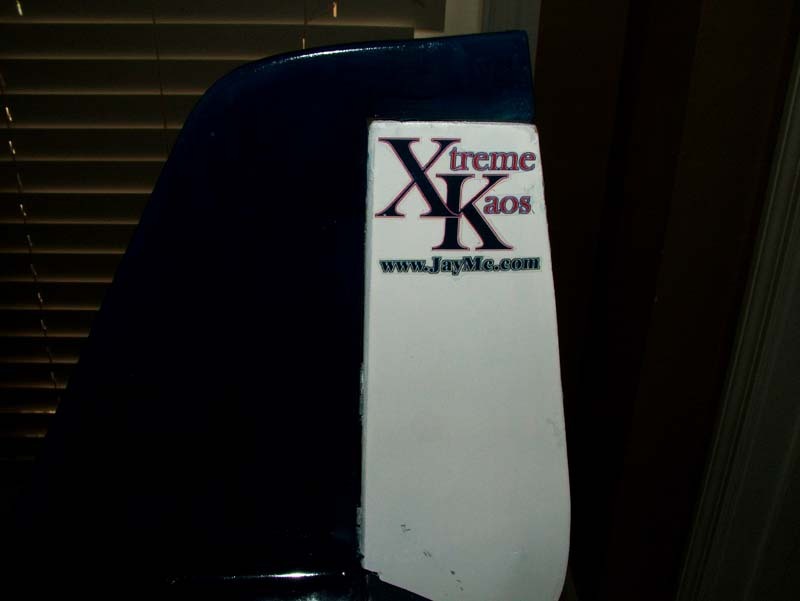 I wanted to be able to print a decal large enough for the wing of the eXtreme Kaos so I had to come up with something different. I called some printing shops and they all want to do a minimum run of 200 or so pieces. I finally decided to try 8 1/2 x 11 clear labels. I printed the design with a laser printer. This seemed to work well but the labels are not completely clear. They are more like Scotch tape, kind of a milky look. I used an X-Acto knife and cut as close to the lettering as possible. 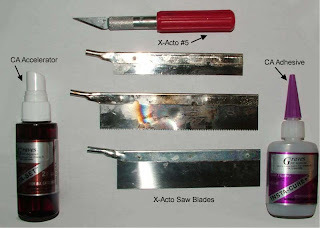 This helped eliminate the milky tape look. I have no idea if they will be fuelproof or not so I am going to spray a clear coat over them. 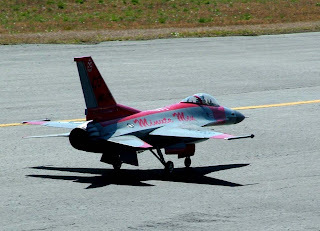 Decals really give your airplane a professional look. If you have any good tips on making decals, let me know! The eXtreme Kaos is coming along nicely. 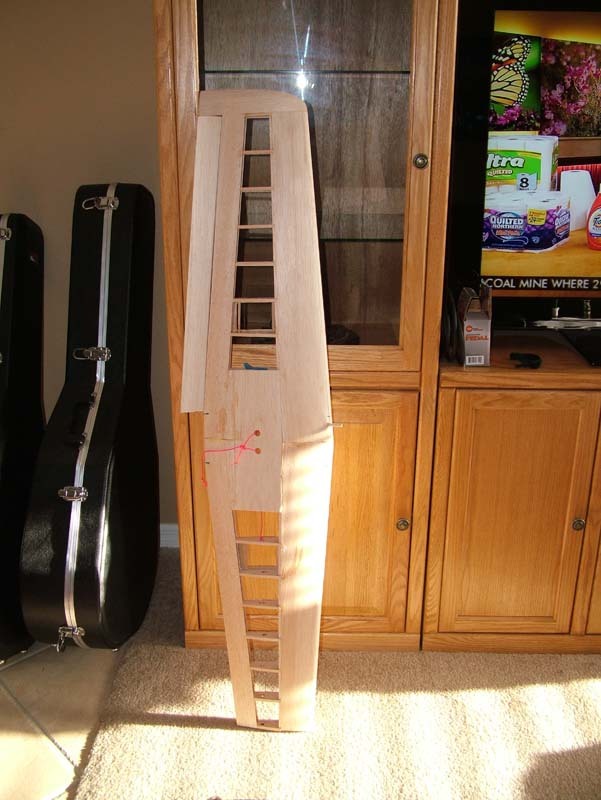 I need to install the radio, fuel tank, carve one wing tip, install one more wing dowel, bottom wing sheeting and then cover the wing. I kept the wing on the eXtreme Kaos shorter than the Utter Chaos and increased the size of the ailerons to increase the roll rate. 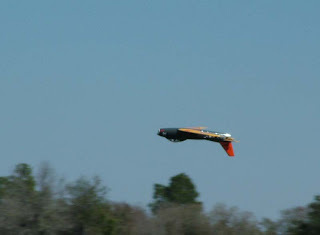 I am hoping to make the maiden flight within a couple of weeks. 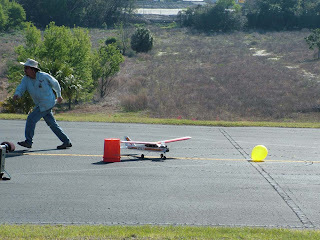 Want to Build a Radio Controlled Airplane? 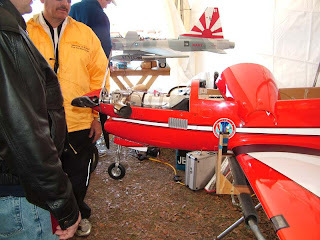 Most people who fly radio controlled airplanes buy the airplanes already built or ARF (almost ready to fly). ARF airplanes are already covered and painted and there is very little work left to do, to get the planes ready to fly. 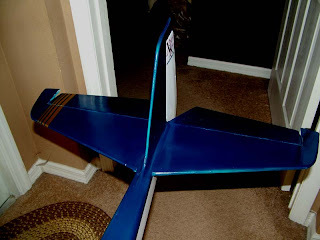 The work usually consists of gluing the horizontal and vertical stabilizers onto the plane, hinging the elevator, rudder and ailerons and joining the wing halves (in some cases, the wings remain separate and are placed on the airplane by sliding them onto a tube). Then the fuel tank, engine and radio must be installed. 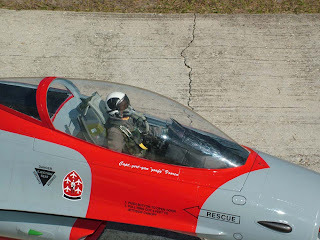 Many of the ARF's can be ready to fly in six to eight hours. 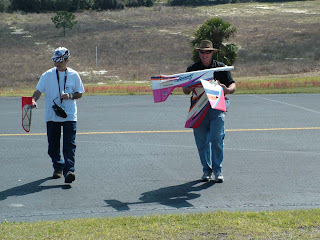 I started flying radio controlled airplanes when I was in my teens. 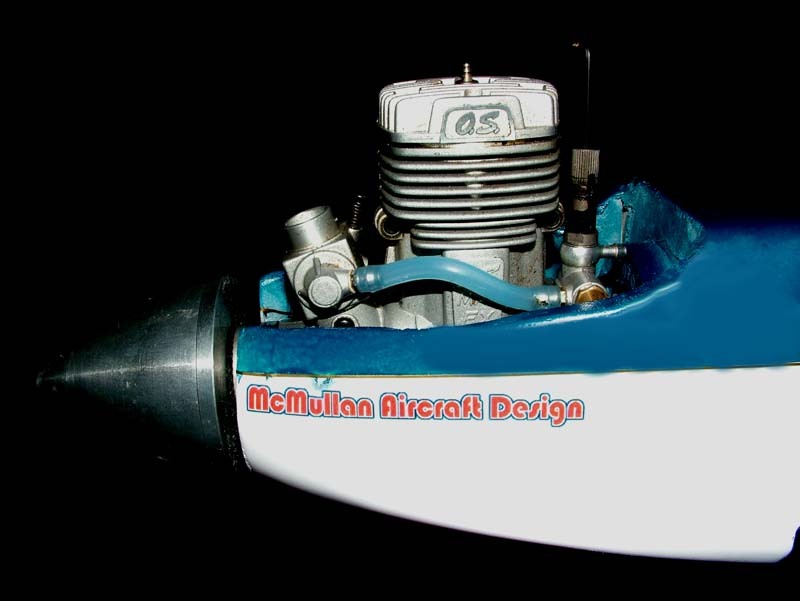 The only ARF's at the time were made by a company named Lanier. The planes consisted of a plastic fuselage and plastic covered foam wings. An acetone type liquid was used to glue everything together. 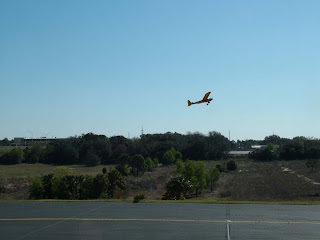 Overall, the planes weren't bad and I learned to fly the larger planes on a Lanier Comet II. 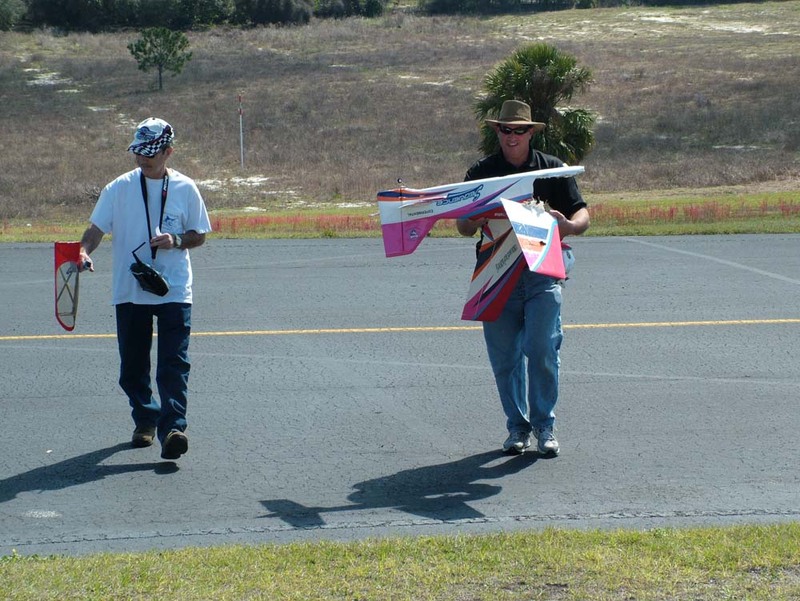 When I began flying RC, most people in the hobby built their own RC airplane. 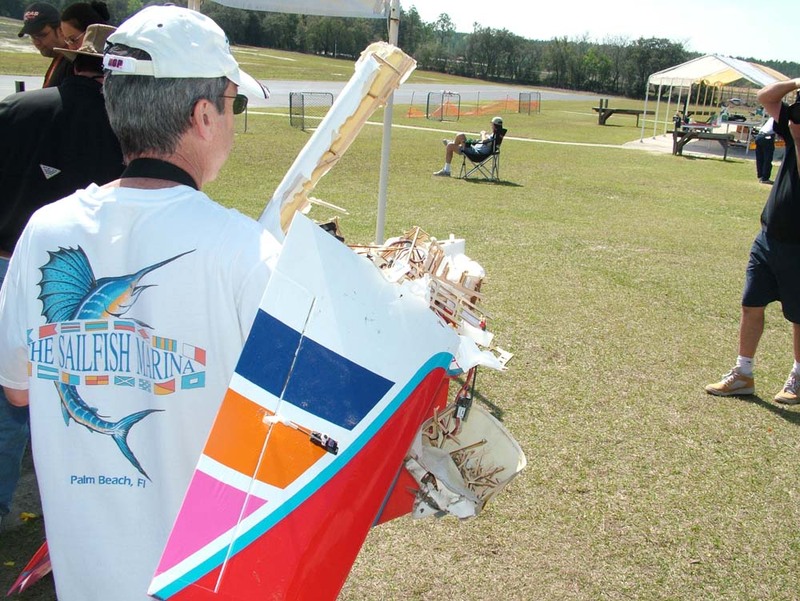 Most of them were of all balsa construction but there were some planes with foam wings and some had fiberglass fuselages. I never had the money as a young man to buy the kits on the market. I did save my money and bought a 3 channel radio and had a couple of Cox .049 engines. 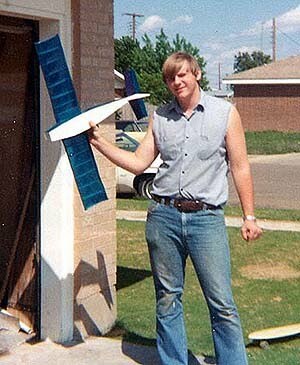 I lived over 100 miles from the nearest hobby shop so every time my family would go to Amarillo, Texas, I would buy some balsa sheets. 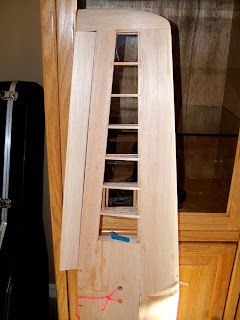 When I got home, I would cut out parts and glue them together with Elmer's white glue and put the three channel radio and the .049 in the plane. I would fly the plane until it crashed which was usually the first flight! I had one, that you see in the photo, that I flew several times before crashing it. 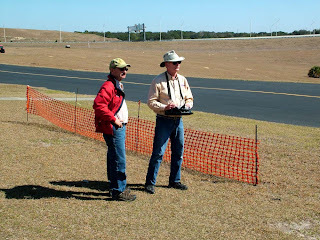 The hobby has changed in many ways in the four decades that I have been involved in it. Some of those changes have been really good, some have not been. 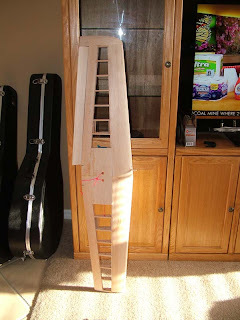 I think it is great that more people can get into the hobby for less money. On the other hand, I think it is a shame that hardly anyone builds any longer. 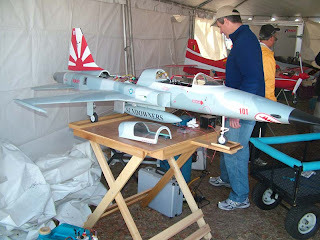 Building a radio controlled airplane and especially one of your own design can be a very rewarding experience. I won't kid you though. 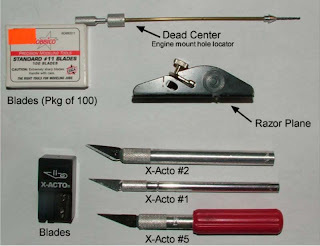 Building a kit tends to be more expensive than many of the ARF's that are available. 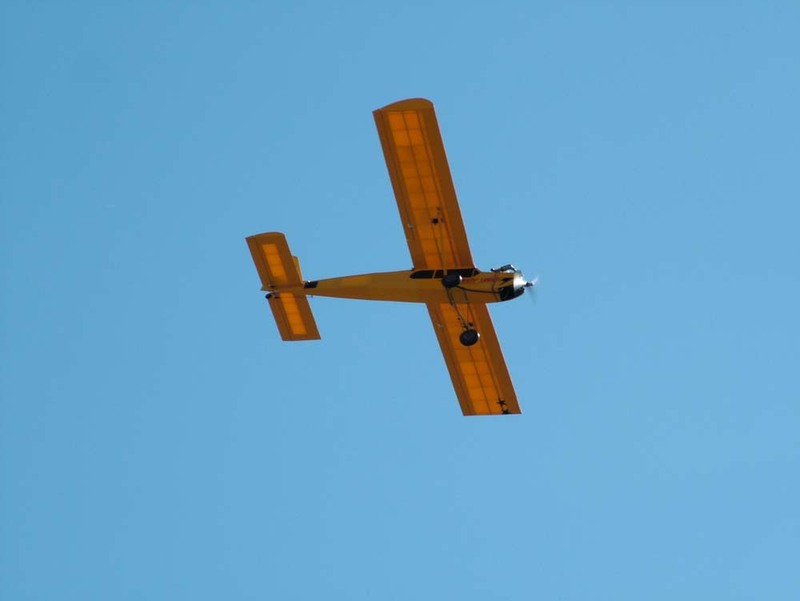 If you design your own airplane, the cost will be even higher than building a kit. But, the level of satisfaction goes up with the price. 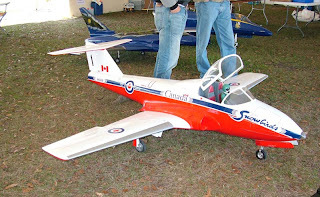 ARF's are great and I have one and I have had several but I also have airplanes that I have built from kits and I have had MANY of those. 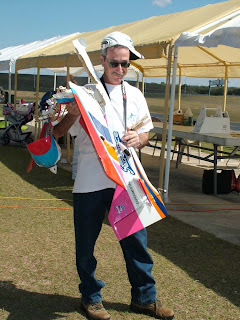 I also have designed many of my own airplanes, built them and flown them. 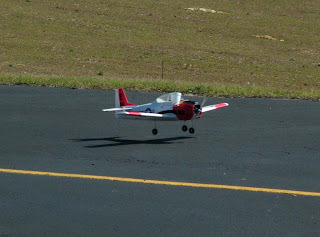 The satisfaction you get when you see the airplane that you designed and built rise into the air, fly and then make a successful landing just can't be beat. 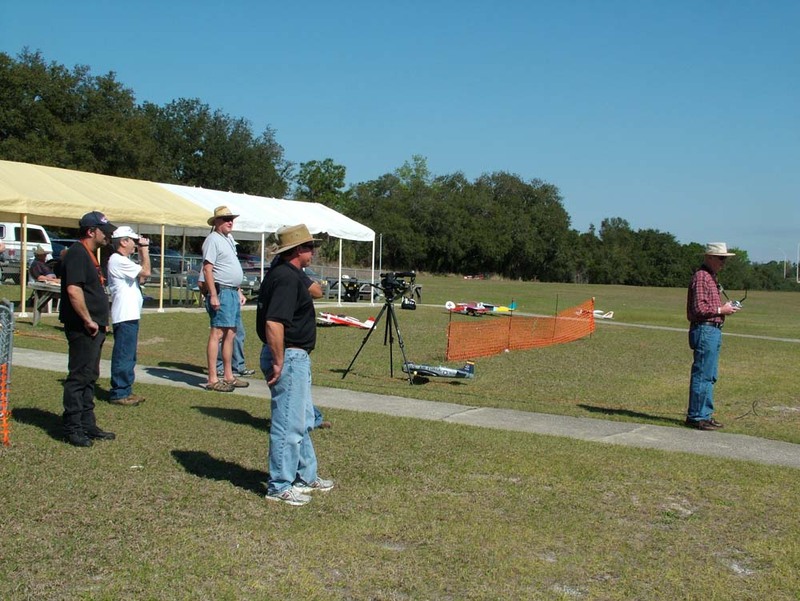 Our RC club the Radio Control Association of Central Florida has had a couple of "building nights" to teach people how RC planes are built. 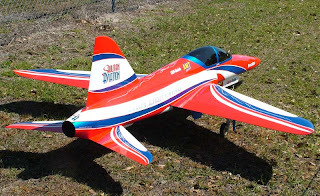 I have decided to put information on my website to aid those that have a desire to design and/or build a radio controlled airplane. I will also be posting some of the information here, on my blog. So, pass the word and let people know who are looking for tips and tricks on how to design and build their own airplane. 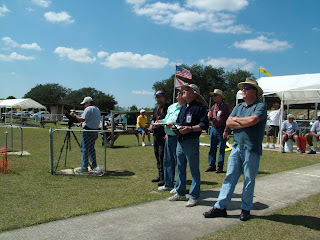 Each year, the Radio Control Association of Central Florida holds a contest called "Geezers vs. Upstarts". The age of all the contestants are averaged and divided down the middle. The younger guys are the Upstarts and the older guys are the Geezers. I had to laugh when I ended up being an Upstart! 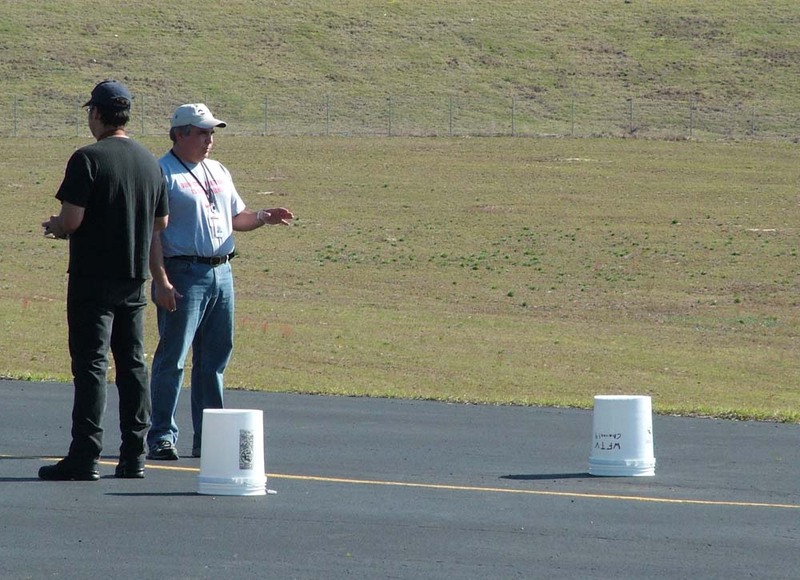 The contest pits one Geezer against one Upstart in different competitions. Scores are added up to see if the Geezers or the Upstarts win. The first event was "blind taxiing". 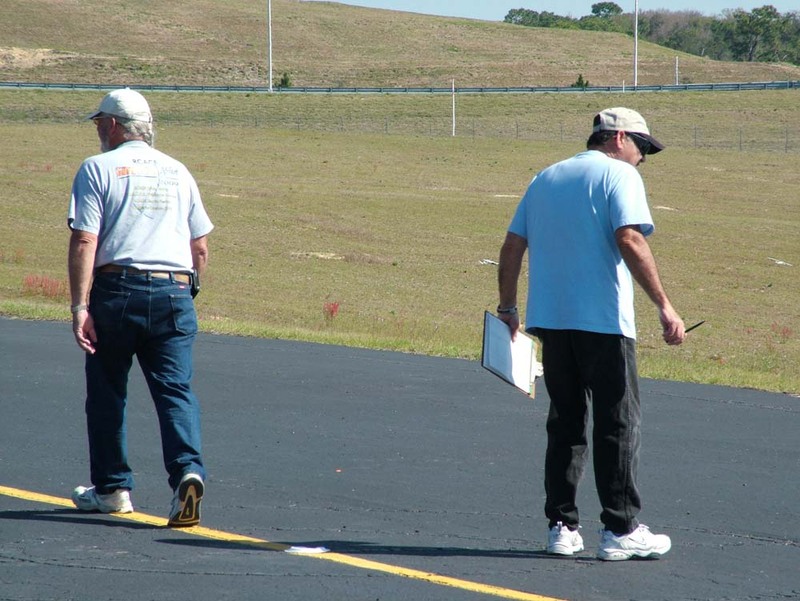 The pilot of the aircraft faced away from the plane while another person told him which direction and what speed to drive the airplane. 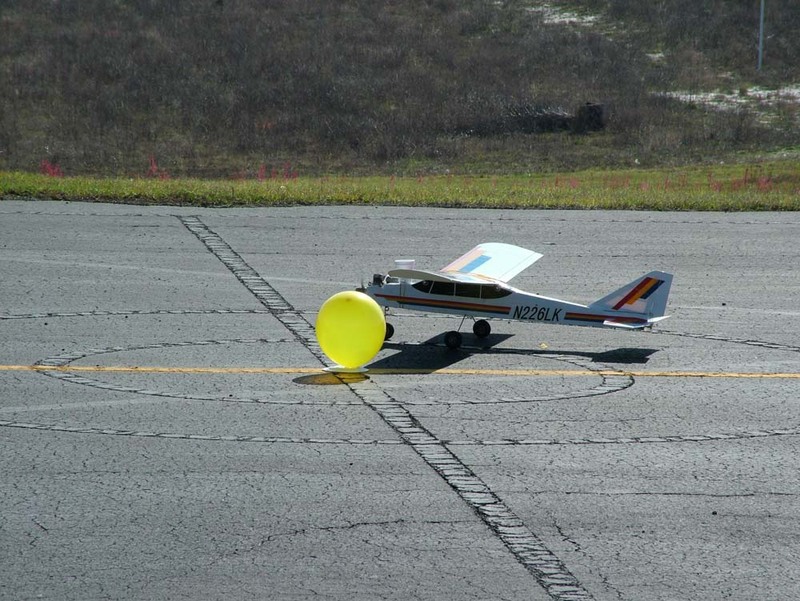 The airplane had to be taxied through some obstacles (in this case, five gallon buckets) and it had to hit a balloon with any part of the plane. 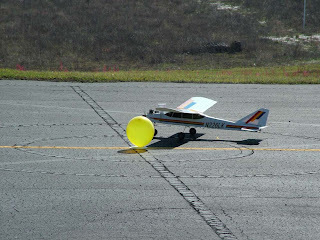 If the balloon burst from being hit by the propeller, an additional ten seconds was knocked off of the official time. I hit the balloon but didn't pop it. The second event was the "bomb drop". 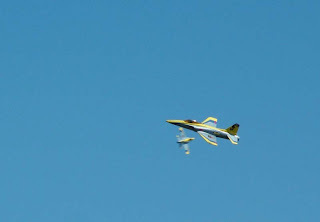 Small plastic Easter eggs filled with plastic bags of corn starch were attached to each plane. 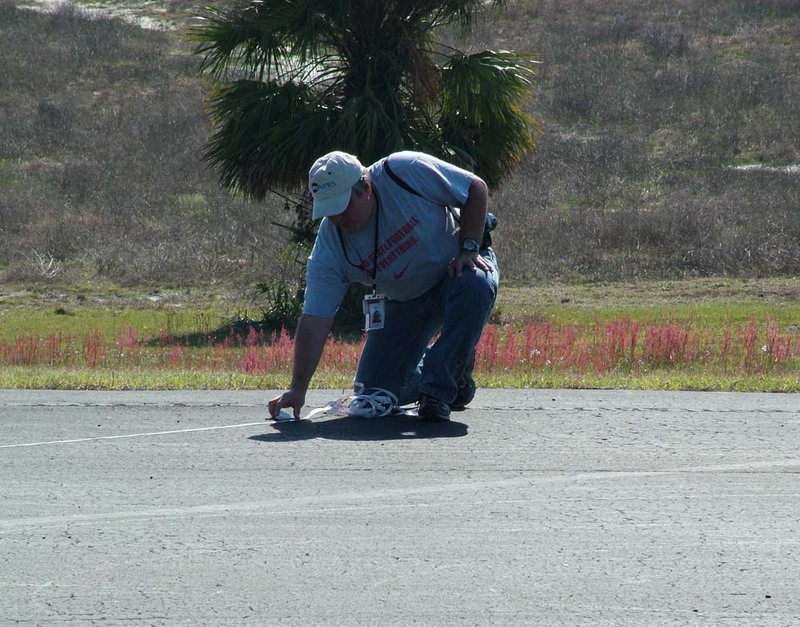 The pilot had to fly over a marked spot and drop the "bomb". The pilot dropping his bomb closest to the target won. The best way we have found to drop the bomb is by rubber banding a cup to the top or side of the airplane and then let the plane dip quickly or roll over to drop the bomb. 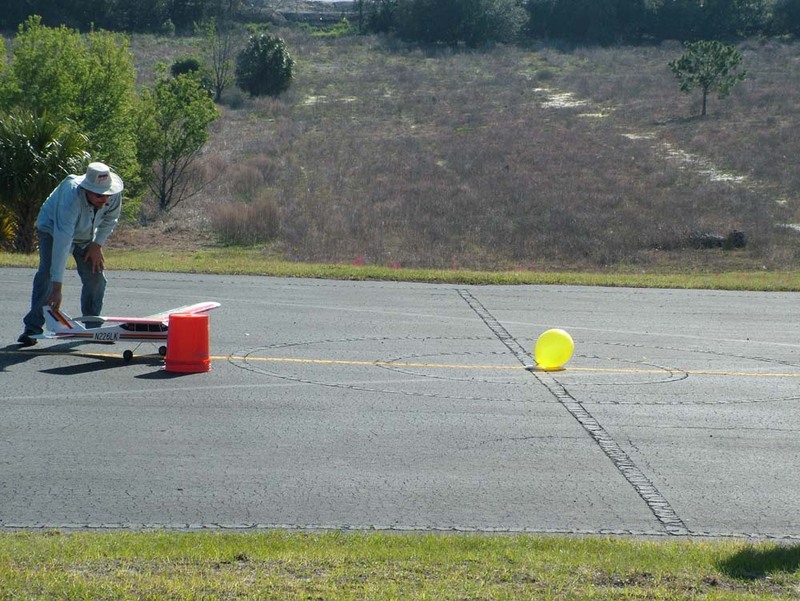 The best bomb drop was made by a little foamy who did some vertical spirals and dropped his bomb about three feet from the target. 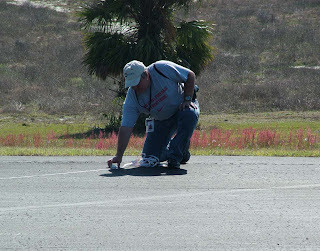 I think I dropped mine about 33 feet away and was the best at the time but my record was quickly beat. 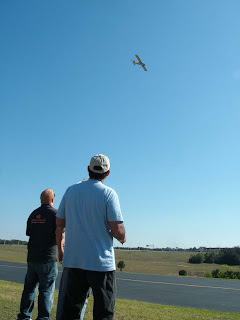 The next event was a time and glide/spot landing. 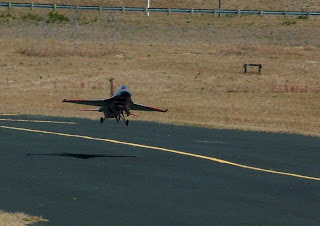 The pilot was given 30 seconds to gain as much altitude as possible, then he cut his engine and had to glide back to the runway. 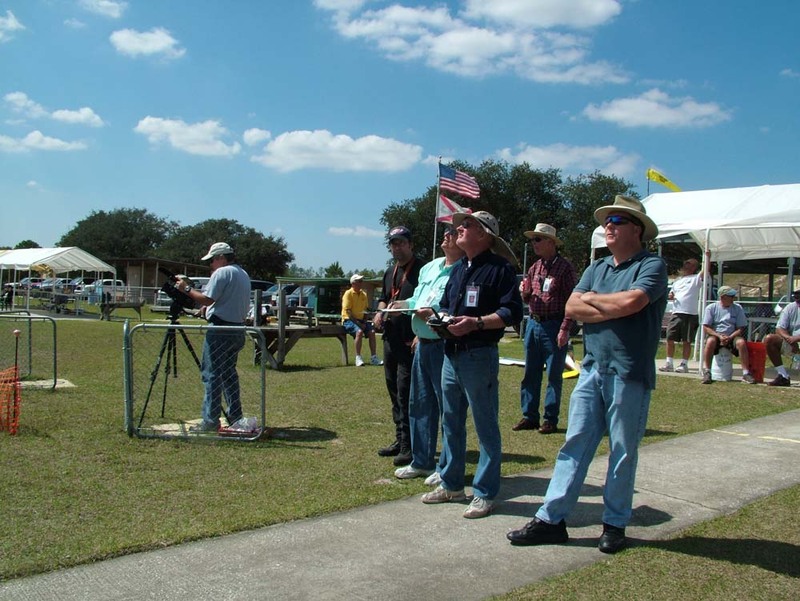 The time plus how close the plane got to the target were calculated to decide the winner. 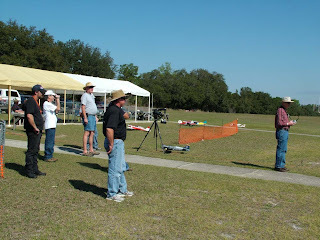 I flew up and thought I had cut my engine but when I got lower, it was still running so I was disqualified. Overall, we had a beautiful day. There was no wind starting out but it started picking up by noon. 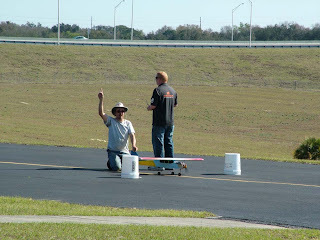 The Upstarts got the best of the Geezers but we all had a great time except for the four airplanes that crashed! My back had been killing me all weekend and I had been laying around too long trying to tame the pain so I drove up to the flying field for a couple of hours. 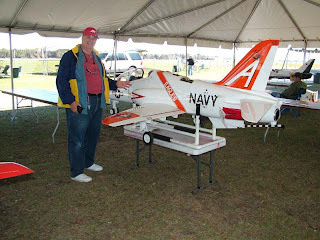 It just so happened that Bob Violett from BVM Jets and his entourage were at the field with some of their jets. 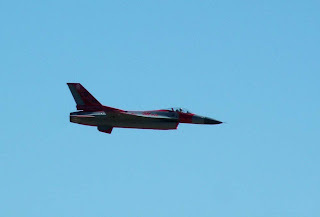 Florida Jets had just ended the day before. 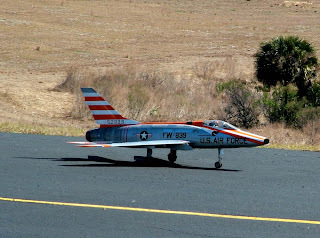 With Bob was a guy from Venezuela that flies some of Bob's models including an F-100 Super Sabre. He told me he keeps them at the BVM headquarters when he is back home in Venezuela. 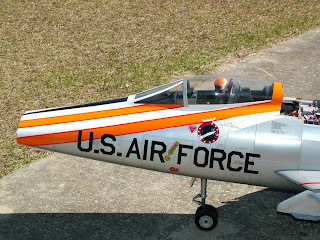 Bob had an F-100D Super Sabre, an F-16, a bandit and an electric jet at the field. 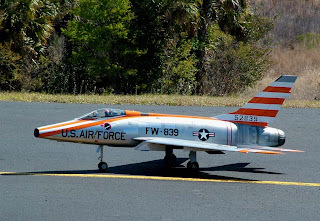 I think the F-100 is one of the most beautiful jets being modeled today. 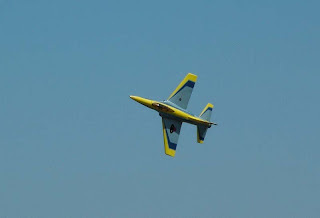 Bob flew his a few times. 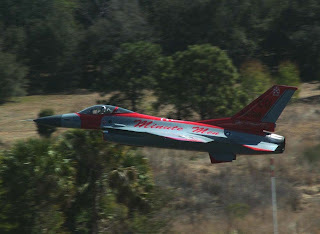 Dustin, Bob's chief flight engineer, flew their F-16. 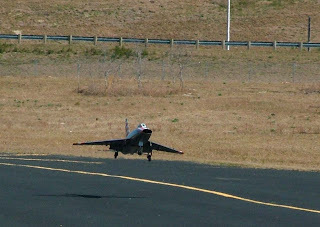 I was amazed at how slowly the F-16 would fly compared to how fast it would fly. 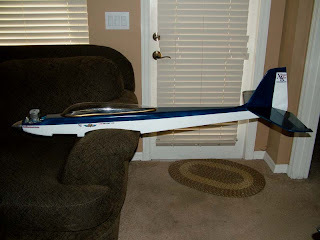 I would love to have a scale jet but I just can't justify the cost. I am glad some people can because I sure like watching them fly! I hope you enjoy the photos. Click on the photos to see the larger versions. Look at the jet blast! 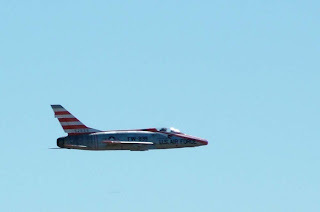 My wife took the day off and we went with friends, Ray and Elaine to the Florida Jets rally. 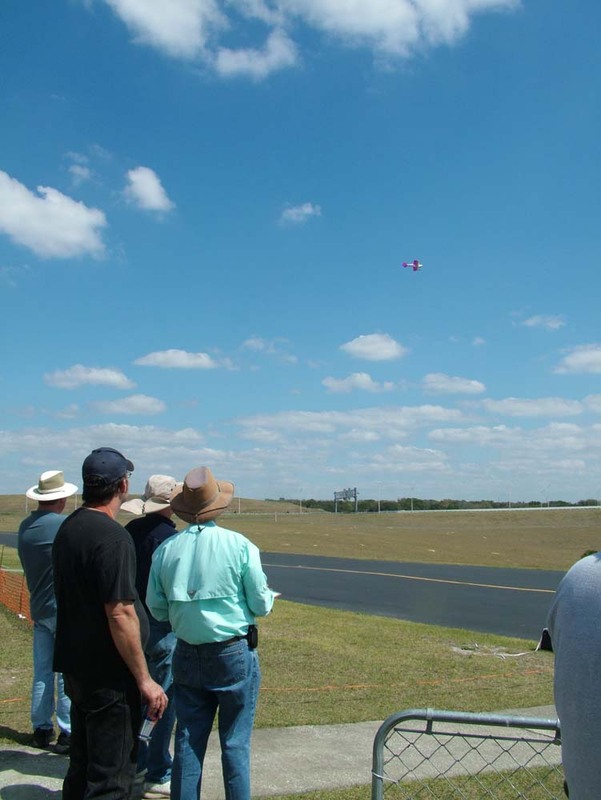 Even though I've flown radio controlled aircraft for more than 30 years, I've never seen a real turbine fly. These things are amazing! They are beautiful, fast and expensive. I just can't justify spending several thousand dollars for something that can be gone in a split second. I used to always tell people I was training to fly radio controlled planes, "If you can't afford to crash them, you can't afford to fly them." 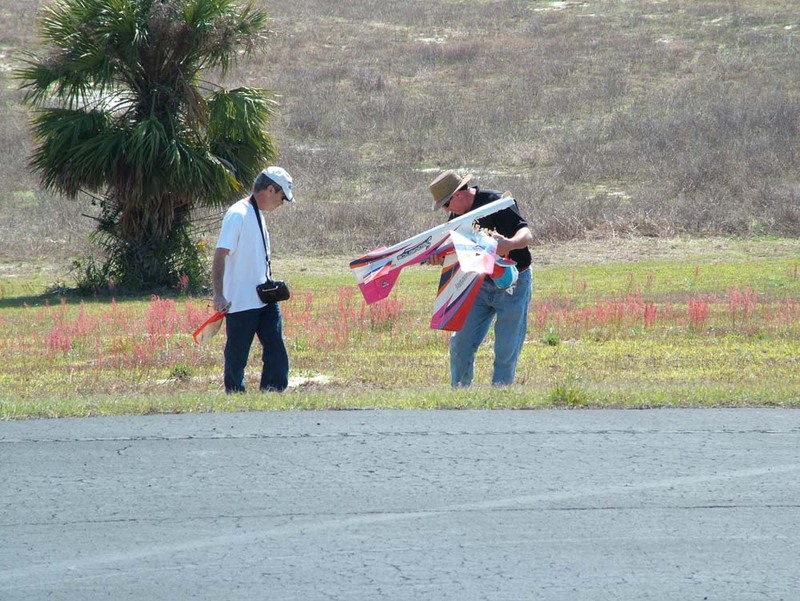 If you fly RC, I can guarantee you there will come a time and probably many times that you WILL crash! 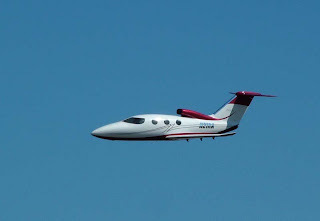 The first plane we saw go in today was BVM KingKat. 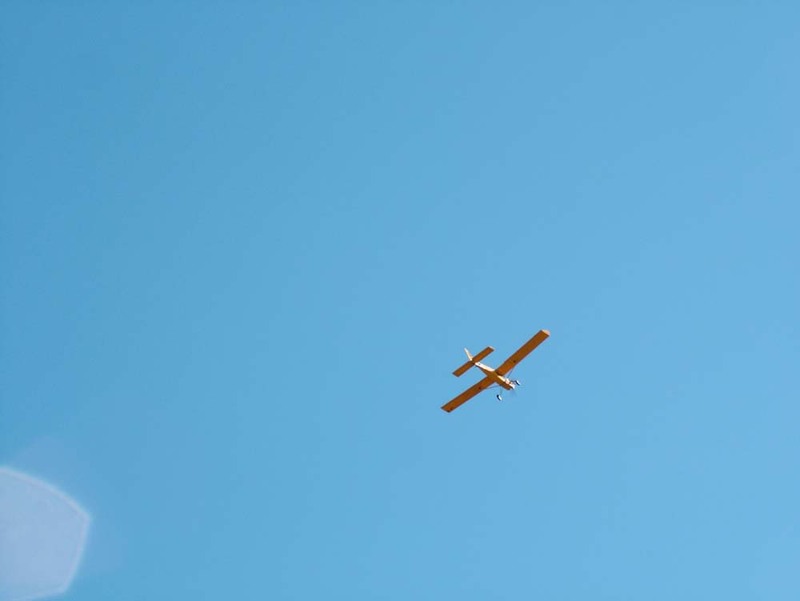 The airplane was worth at least $10,000 and probably a few thousand more. I looked up when he was about 50 feet off the ground and I knew he was going in. 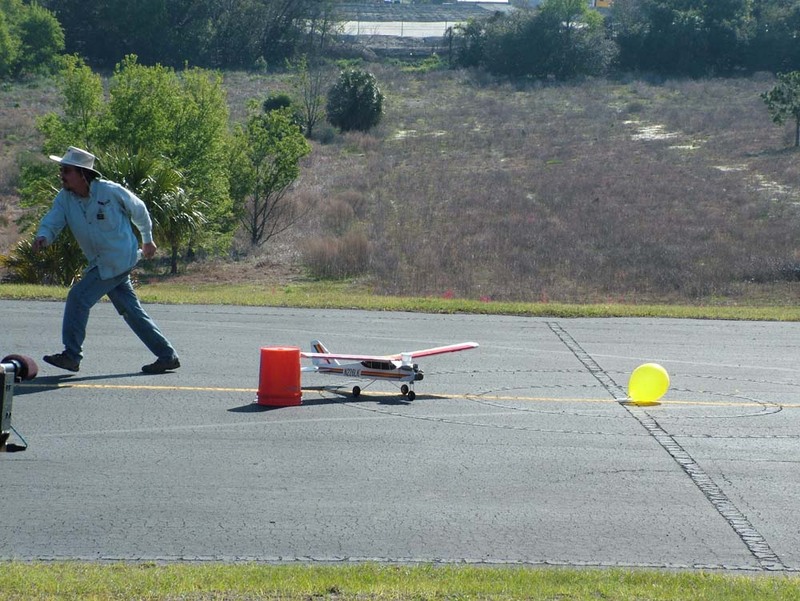 The plane was probably flying 100mph when it hit the ground. I took photos with my film camera and will post them when I get them developed and scanned. The plane instantly burst into a fireball about 30 feet in diameter and a black mushroom cloud rose over the crash site. It didn't take too long for the ground crew to get to the accident location and put out the fire. 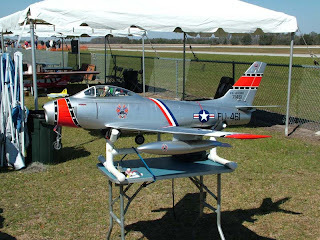 The next plane to crash was scale P-80 Shooting Star. 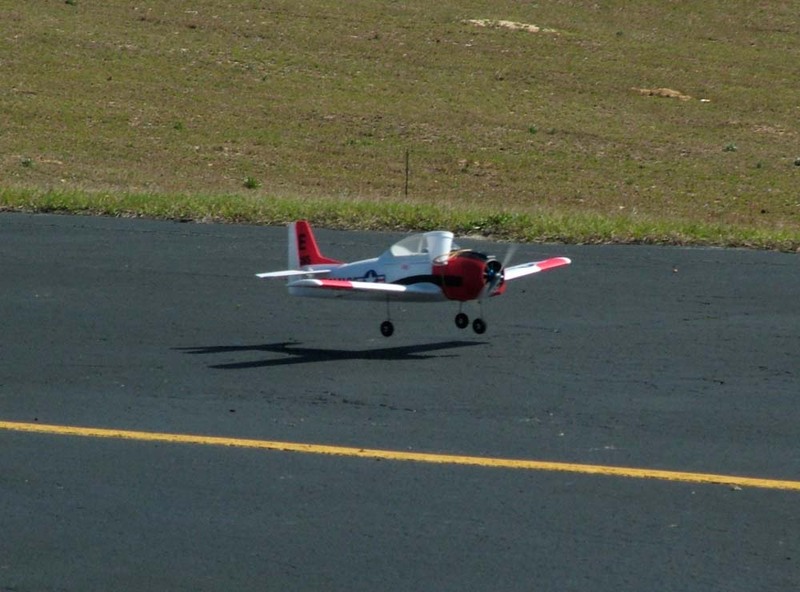 When the pilot took off, I thought he was purposely rocking his wings. As he gained more altitude, I knew he was in trouble. I looked away when I heard my friend's wife scream then I heard the impact. The plane also burst into flames and by the time the fire crew got to it, it was pretty much toast! Several more thousands of dollars bit the dust. 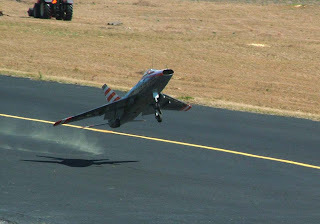 A very large and beautiful F-86 Sabre made a beautiful flight and when the plane was brought in for a landing, the pilot got a little too high off the runway and stalled, slamming the plane down hard. 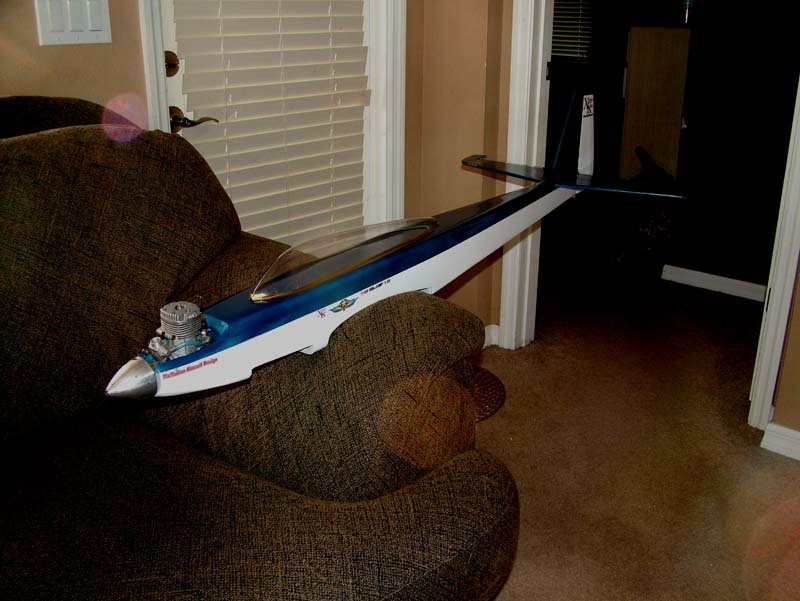 The plane instantly buckled in the middle and the damage was done. The right wing panel was destroyed too. I'm sure the owner of this plane had well over $20,000 invested. 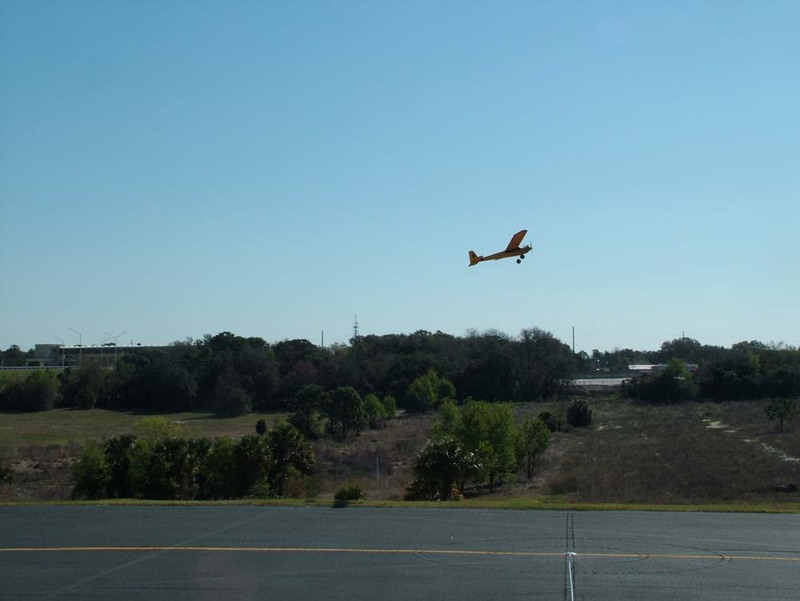 The fourth plane was taking off when the cross wind got him off course and turned toward the fence on the side of the runway. 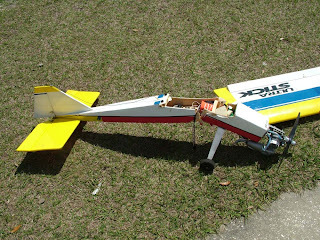 The pilot decided to try and take off and when he did, the plane snap stalled and landed upside down and skidded into the fence. It may be able to be repaired. It was an exciting day! Although I hate to see anybody crash any model airplane, it is what makes our hobby challenging. 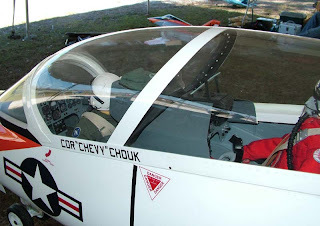 One of the more unique planes was an F-14 Tomcat with twin turbines and working swing wings just like the real jet! The plane was for sale for $5,250 and that included the landing gear and the swing wing mechanism. 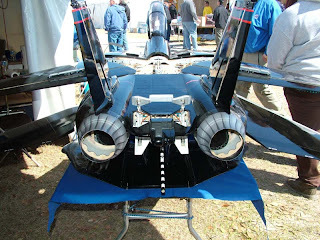 That is not a bad price at all for as large a jet as it is but don't forget that you have to purchase two turbines and they will probably set you back about $8,000 and a good radio will be around $1,000. 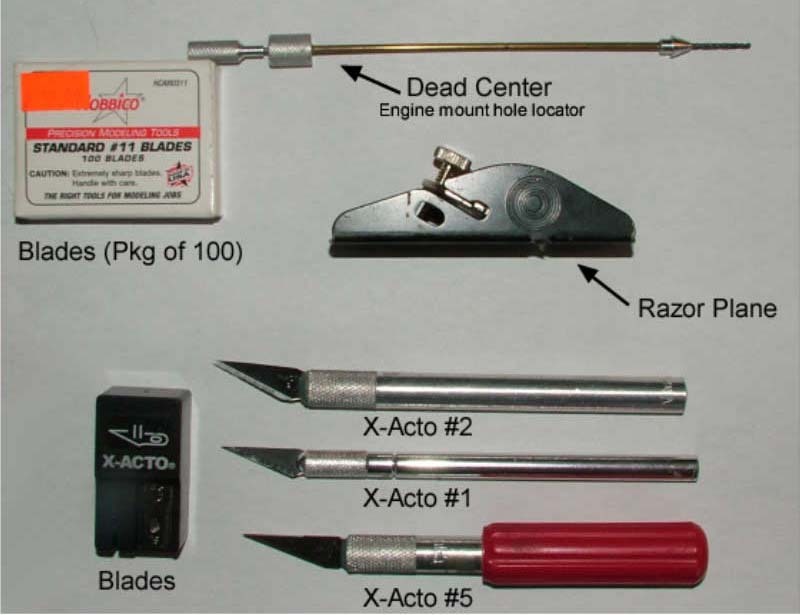 By the time it is all said and done, to set this plane up, it will cost you around $15,000 +. 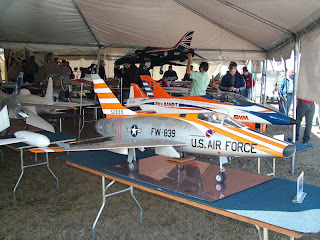 There were so many planes that were so incredible, it is hard to pick out my favorites. 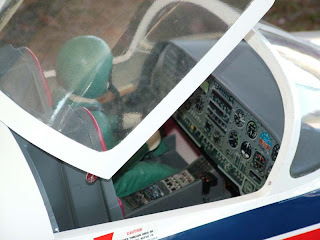 I was impressed by an EMB-14 Super Tucano. 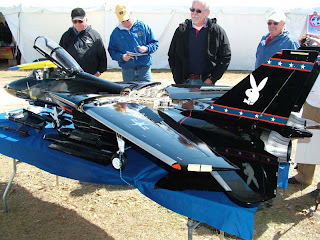 This is a prop plane but uses a real turbo prop engine complete with smoke system. It sounded great with the turbine spinning up and the prop turning. What an impressive sight! 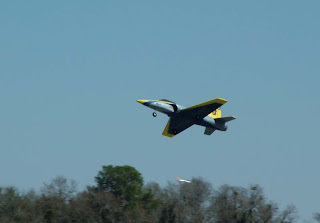 Parkzone puts out an electric "jet" which is really a ducted fan called the "Habu". 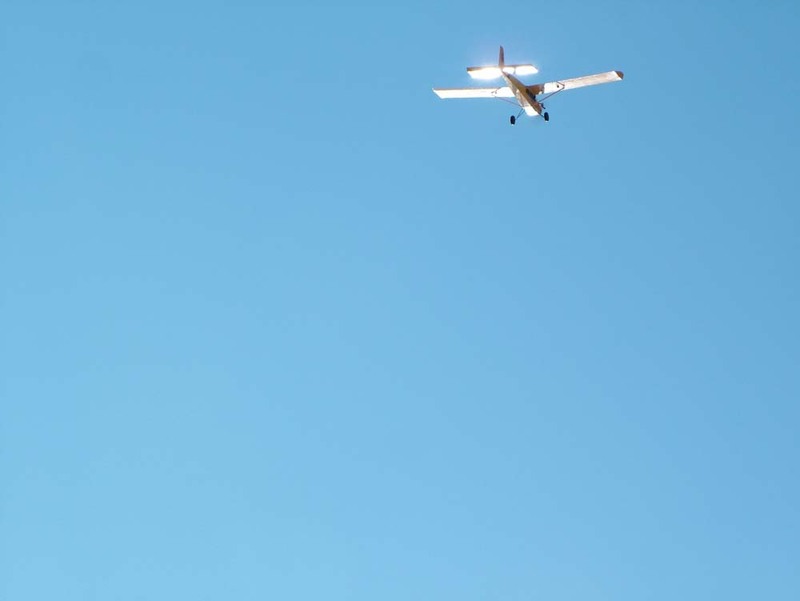 The whole airplane with radio is only $400. At one time today, they had 14 in the air. 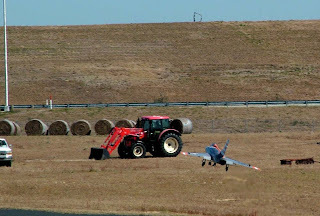 It is really a wonder that there were no mid air collisions. 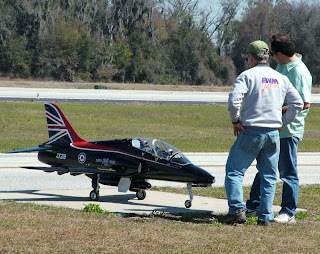 This is an awesome little jet and I would like to add one to my livery one of these days if I can convince my wife of the great need I have of one! 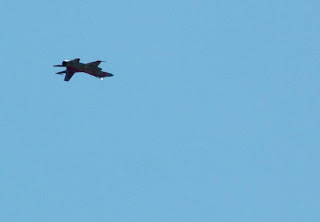 There were some European Typhoon fighters that were amazing. They could hover them and do beautiful waterfalls. 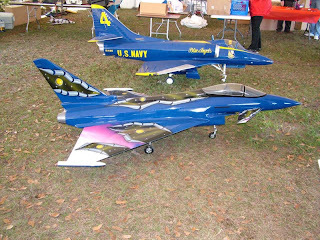 They were my wife's favorite planes. 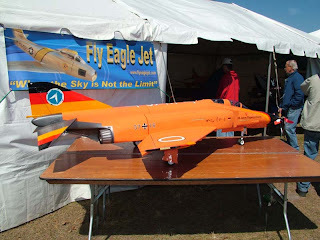 We had a great time at Florida Jets. 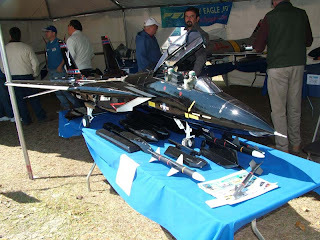 The next big rally I will go to is Top Gun, a major event with super scale airplanes. 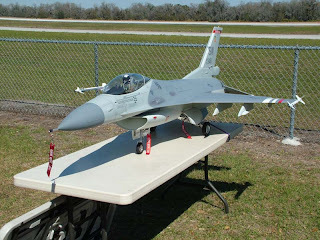 The airplanes entered in Top Gun are museum pieces. I have wanted to go for years and this will be my first time. I can't wait! 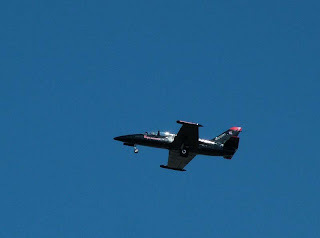 This EMB-14 Super Tucano was the only turbo prop at the meet. Very impressive! 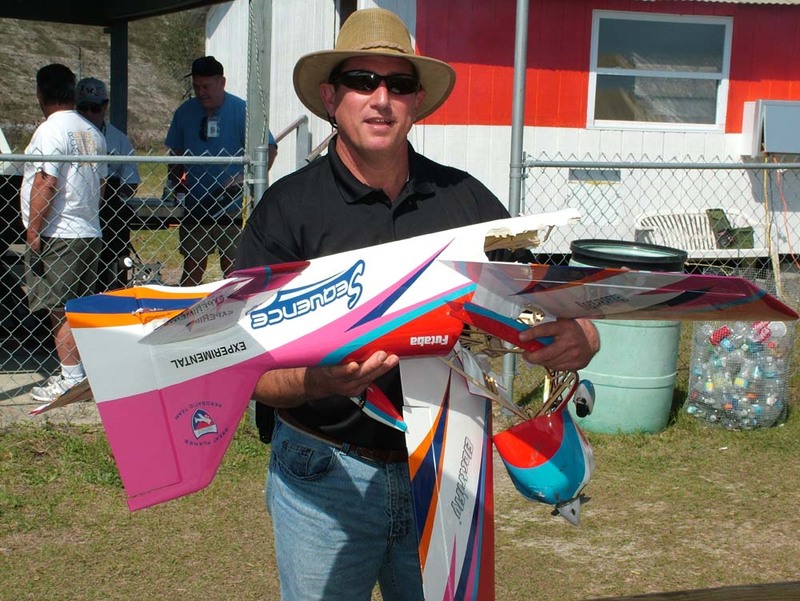 This plane was flown by David Shulman who broke the RC jet world speed record in Jan 2010 at over 337mph! 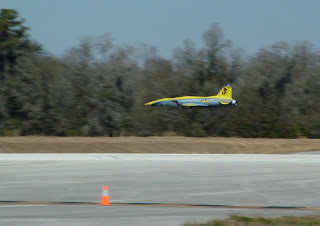 This thing was flying around at 200mph not over 10 feet off the ground!